At a time of bitterly divided politics in our country, the passing of Nelson Mandela offers us a valuable reminder of how great leaders can bridge great divides and get reconciliation right. Among other memories, I am reminded of how nervous I found South Africans of all colors to be in 1976, the summer of the historic uprising by schoolchildren in the black Soweto townships near Johannesburg during my first overseas reporting assignment for the Chicago Tribune, where I still work. There was little doubt that Mandela was the republic's most popular and unifying black leader, even as he was serving a life imprisonment sentence on Robben Island for plotting to overthrow the country's white-minority regime. The country's white population, vastly outnumbered by nonwhites, understandably was haunted by nightmarish "bloodbath" visions of racial retribution. They weren't alone. Many nonwhites -- divided by tribal ethnicities or by the apartheid system's bureaucratic designations "black," "colored" (mixed race) and "Asian" -- also were apprehensive of interethnic rivalries as ancient as the Zulu, Xhosa and other tribal factions. By then, Mandela had been kept out of touch with his public for so long that many wondered whether he would be able to take charge even of his own ANC, which, according to various reports and rumors, had fallen into divisions and disarray. Could he live up to his own eloquent promises of democratic rule and racial equality? It is a sign of America's old Cold War wariness that Mandela and other leaders of his African National Congress remained on the U.S. terrorism watch list long after he was released from prison in 1990 and elected president in 1994. President George W. Bush signed a bill to remove them from the list in 2008 at the insistence of then-Secretary of State Condoleezza Rice. That was long after Mandela shared the Nobel Peace Prize in 1993 with F.W. de Klerk, the South African president who released Mandela after a stunning 27 years in prison and worked with him to end apartheid. It is a tribute to both men that, while never the chummy buddies depicted in some photographs, they transcended their differences and worked with the circumstances that history had left them. In that mission, Mandela's orderly transition of power when his term ended in 1999 was just as valuable as his election. In a continent where postcolonial democracy has been defined too often as "one person, one vote, one time," Mandela would not try to be a president-for-life. For that, I think credit goes to two qualities that gave Mandela the tools he needed to make history: his education and his deep faith as a lawyer in the rule of law. He rose from village life to be the only black law student in his class at the University of Witwatersrand, the nation's top university and a launching pad for his later activism. Even under the daily oppression of the apartheid system of racial segregation, he saw in the law a valuable tool for both change and stability, depending on how you used it, and he used it to build a new South Africa. "It is no coincidence that in the years since Mandela's release so much of Africa has turned toward democracy and the rule of law," wrote President John Dramani Mahama of Ghana in a New York Times op-ed. "His utilization of peace as a vehicle of liberation showed Africa that if we were to move beyond the divisiveness caused by colonization, and the pain of our self-inflicted wounds, compassion and forgiveness must play a role in governance." 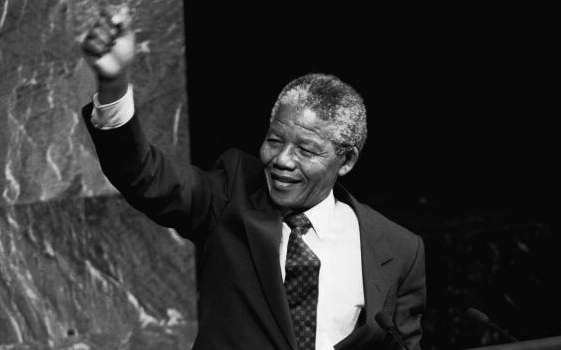 Unfortunately, controversies surrounding his successors, such as South Africa's current president Jacob Zuma, sometimes fall short of Mandela's ideal. Yet his legacy set a high standard by which others will be measured in South Africa -- and the rest of the world. "What made Nelson Mandela great was precisely what made him human," Zuma said in a speech. "We saw in him what we seek in ourselves." Indeed. We also can see in him what we all should seek in our leaders.